Tom Kunzler has been appointed as interim director of digital transparency organization Open State Foundation. The appointment is effective on July 1, after Arjan El Fassed resigned recently. El Fassed was the organization’s director since 2013. Tom Kunzler has been with Open State Foundation since 2013. He served as programme manager Politics and Governance and has been a member of the organization’s management team. With his appointment the organization will complete a search for a permanent new management. Together with Lex Slaghuis, cofounder of Open State Foundation, who announced his resignation earlier this year, El Fassed and Kunzler will share their views on the past, present and future of open data and the unique role therein of Open State Foundation. Slaghuis became partner of a new company My Data Team and El Fassed joins Google in the Netherlands as head Public Policy & Government Relations. El Fassed: ‘Open State Foundation has grown into an unique player in the area of digital transparency, an important supercharger of open data for public accountability and the most important advocate of open data users. The organization is in good shape to strengthen that role further. With a proud feeling and with full confidence this is a good time for me to start a new challenge’. Chairman of the Board Stef van Grieken: ‘Open State Foundation has developed under the leadership of Arjan El Fassed and Lex Slaghuis into a forerunner in the field of transparency and public participation. With projects that make healthcare costs transparent, test the security of government websites, opens up information on education, make locations of polling stations accessible to millions of people or enable the reuse of Dutch art and culture, Arjan and Lex, together with the team, have managed to bring the organization to a great height. The receipt of the Open Government Partnership Award in the presence of the former French president Hollande in Paris was the crown on that work. 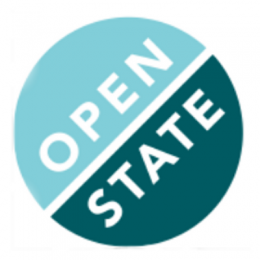 Open State Foundation is fantastic, and we are very grateful to Arjan and Lex for their contribution’.